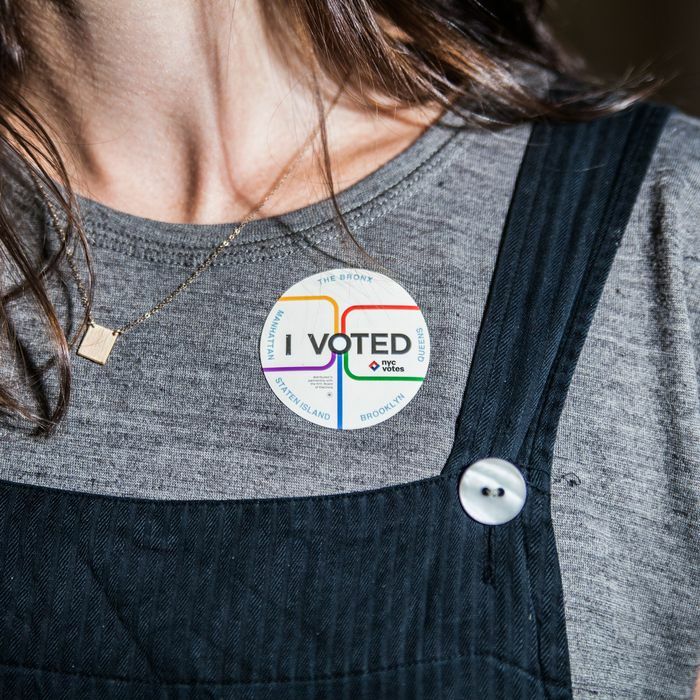 Starting at 5 p.m., show up at this Bushwick brewery with your “I Voted” sticker and score $1 off draft beers. These two Lower East Side spots will set up in Washington Square Park from 12 p.m. to 2 p.m. to give away free champagne and ice cream to anyone with an “I Voted” sticker. Get a free tea cookie with an “I Voted” sticker. A free cup of coffee for anyone wearing a voting sticker. Get a “House Scoop” ($2.37) with Senate Sprinkles ($0.25) with your “I Voted” sticker. Free mini Cinnamax ice-cream sandwiches (cinnamon ice cream between two snickerdoodle cookies) at the shops on Front Street and Orchard Street with an “I Voted” sticker. Enjoy 18 percent off all scoops storewide with a sticker. Get a $1 sprinkle cupcake with an “I Voted” sticker. At Fany Gerson’s ice cream shop, an “I Voted” sticker will score you a free hot chocolate. Great on a rainy day. Get a free signature cookie — brown-butter salty cookie, oat chocolate-chunk cookie, ginger molasses cookie, chunky peanut butter cookie, chocolate fudge cookie, or white-chocolate cranberry cookie — with a sticker. Hit the polls and get a free hot chocolate. Unsurprisingly, the self-described “drunk bakers” are giving out free shots to anyone with an “I Voted” sticker. Voters under 21 not included. Grab a free small coffee with your sticker. Liberté, egalité, fraternité, and free chouquettes for voters. Show your “I Voted” sticker at any Shake Shack location and score free crinkle fries with any purchase. Or use the code “ivoted” in the app to get the deal. The Gowanus brewery is offering buy one, get one free drafts of their People Power beer, a very drinkable German pilsner with honeysuckle and genmaicha tea, all evening long for voters. Both locations of the beer shop/general store are giving free 8-ounce cups of drip coffee to voters. Bring your “I Voted” sticker to any one of the sandwich shop’s four locations and receive a free coffee or tea. All proceeds from purchases of the shop’s Election Day Crullers will go to the charity organization When We All Vote. Stop by this Williamsburg restaurant with your “I Voted” sticker and you’ll get a free Miller High Life. Okay, it’s not a restaurant, but if you come to this movie theater with your “I Voted” sticker you’ll get a free small gourmet popcorn courtesy of the upcoming Flynn McGarry documentary. Show up with your sticker and get $8 glasses of champagne from Reynard and The Ides. Get 10% off orders with an “I Voted” sticker. ﻿Bring in your “I Voted” sticker and snag a free glass of wine. Trade in your “I Voted” sticker for a free Molson brew. ﻿Bring in your “I Voted” sticker and get $1 off your order. ﻿Showing your “I Voted” sticker will earn you a free shot of whiskey or tequila. Perfect for celebrating or easing the pain. ﻿If you bring in your sticker, The Dynamite Shop will give you a free cup of coffee to help keep you energized for all those late night election results. Show your “I Voted” sticker to receive a buy one, get one rice krispie treat. All Toby’s Estate locations will offer $1 small drip coffees to anyone with an “I Voted” sticker. ﻿Head on over to any one of the four Black Seed Bagel locations to receive a free cup of coffee with any purchase when you show your “I Voted” sticker. ﻿Starting at 5 p.m., Left Bank will waive its corkage fee for anyone who comes in and shows their “I Voted” sticker. For the past month, Left Bank has helped register people to vote and has provided New Yorkers information on how to check their voter registration status. ﻿Show this post at any Union Square Hospitality business for a buy one get one free cocktail. ﻿Treat yourself to a free cookie after performing your civic duty. Just head over to the Larder and show them your “I Voted” sticker. ﻿Starting at 4 p.m., get $1 off all draft beers when you show your “I Voted” sticker. ﻿Bring in your “I Voted” sticker and happy hour prices will last all day for you over at Honey’s. ﻿Walk in with your “I Voted” sticker and walk out with a free 8oz La Colombe coffee. ﻿Show the staff over at Lossie Rouge your voting sticker and the first drink is on them. ﻿If you head over to any Joe Coffee Company location wearing your “I Voted” sticker you can leave with a free 12 oz cup of fresh drip coffee. This post will be updated throughout the day with new deals and parties.